Mrs. Heath, Ladies' Hatter of 25 St. George's Place, Hyde Park Corner, London. 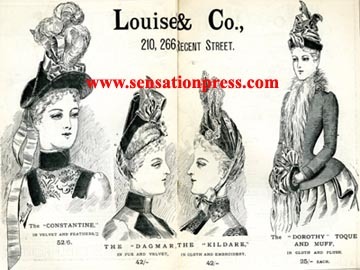 Hatter to the Courts of England, France, Russia, Prussia, Austria, Belgium, Netherlands, & c.
Hats by Louise & Co. of Regent Street. 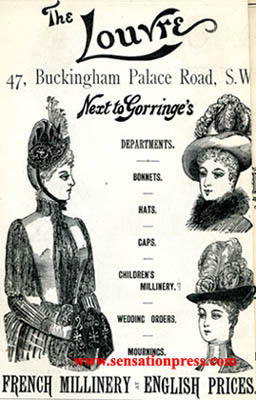 Hats by The Louvre of Buckingham Palace Road. French Millinery at English Prices. 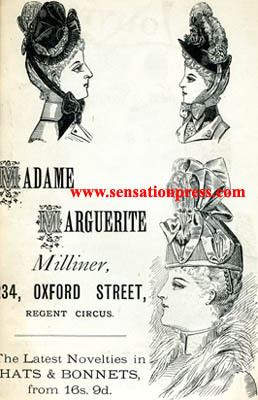 Madame Marguerite, Milliner of Oxford Street. The latest novelties in hats and bonnets.